Commissioned as a gift for Philippe Gorczynski, this picture tells the story of the Deborah D51 – the British WW1 Mk IV female tank that was put out of action by German artillery during the operations at Cambrai on 20th November 1917. Philippe was instrumental in the rediscovery and excavation of the tank in 1998, which had lain buried for 81 years, so it seemed appropriate that this picture should follow the various stages of Deborah’s “life”. Top left she is in her prime, driving through the village of Flesquières just before she was hit by five German shells. The picture on the right shows her as she was just after being excavated, still lying in the ground; and the final view is of Deborah as she is today, taking pride of place in Philippe’s barn: a proud memorial honouring the men who served and lost their lives in her. With Philippe’s kind permission you can buy a limited edition print of “The Story of Deborah D51” from my online shop. 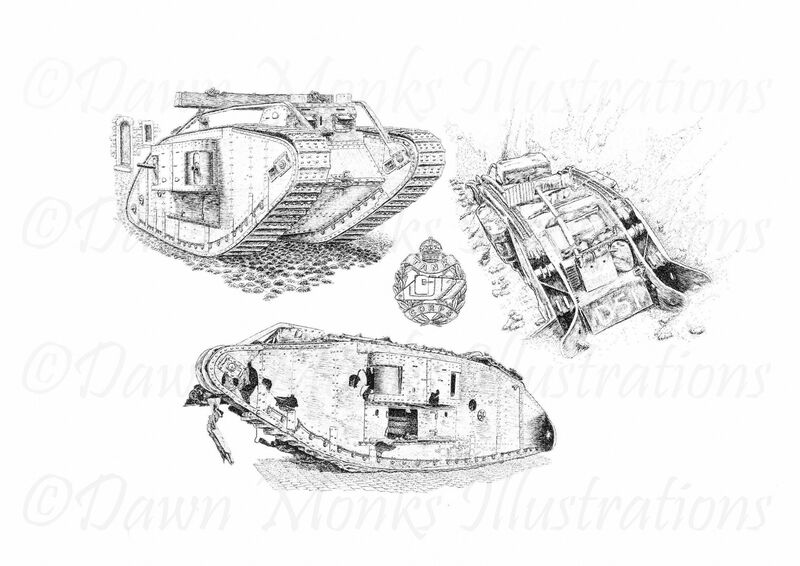 For every print sold a donation will be made to the funding of a purpose-built museum in which the tank will be preserved and protected, as befits her Historical French Monument status. You can find my picture in memory of the crew of Deborah D51 here. For more information about the Deborah D51 visit Philippe’s website. If you have an idea for a special picture that you’d like me to draw you can contact me here. Dawn Monks Military Art & Illustrations | Powered by Mantra & WordPress.